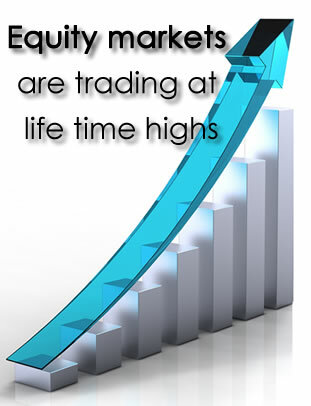 Home › Global News › Few reasons why equity markets are trading at life time highs and may continue to do so. Few reasons why equity markets are trading at life time highs and may continue to do so. SENSEX & NIFTY closed up by 0.1% & 3.5% on weekly basis in past two weeks, leading to life time highs for both the indices of 27,869 & 8,337 respectively. Experts say that Indian markets are in long term bull phase right now, helped by easing inflation, easing crude oil rates & improving macros. FIIs have return back with net buyers after sell offs in past few weeks due to Fed move. US Fed has said that it will keep low interest rates for a long period. This news is a big factor as rate hikes could lead to FII outflows. FIIs have bought in both cash markets and in derivatives. Bank of Japan on Friday 31st October, 2014 said it will provide stimulus of 30 to 80 trillion yen, which lead to over 5% gain in Japan’s index Nikkei on that particular day and gains in world wide markets. US markets also closed at life time highs due to these factors. Also crude oil rates have come down sharply due to increased supply by non-OPEC countries mainly by US Shale gas. So experts say that crude oil will remain at low prices in long run. It is a very positive factor for domestic markets as India is net importer of crude oils. It also helped the Govt. to deregulate diesel prices on Oct 18. It will reduce the subsidiary burden of govt. and will thus help to meet the fiscal targets. Lower crude prices will lead to further easing in inflation as both petrol and diesel prices were decreased by over INR 2.25 per litre in last week of October. Inflation is easing from last couple of months and further factors like fall in crude oil prices will help to maintain this trend. It will help the RBI to bring inflation numbers under the set targets for both FY 15 and FY16, which earlier was very skeptical. RBI focused on inflation over growth from past couple of quarters. So it didn’t do any rate cuts in repo rates from a long period. But we may now expect the rate cuts in repo rate in coming period which will provide further boost to markets. Even without any rate cuts Indian markets have outperformed this year. The major reason of this is the improvement in Macros after the BJP led govt. coming into power. Prime Minister NaMo is bringing out reforms to fasten the policy crises which had been seen in UPA govt. Modi is taking steps to fasten the process of long awaited projects. Also the earnings of corporate are increasing which is very positive for Indian economy. GDP forecasts of India have been improved by both World Bank and IMF along with other rating agencies. Due to the combined results of all these factors Indian markets are trading at life time highs and may also outperform in period coming ahead.